These little Homemade Cheez-Its are going to save me some cash and time when in a pinch. My littlest guy would eat Cheez-Its all day long everyday if I would allow him to, ha ha. He is addicted, seriously addicted. I really can not say as I blame him. 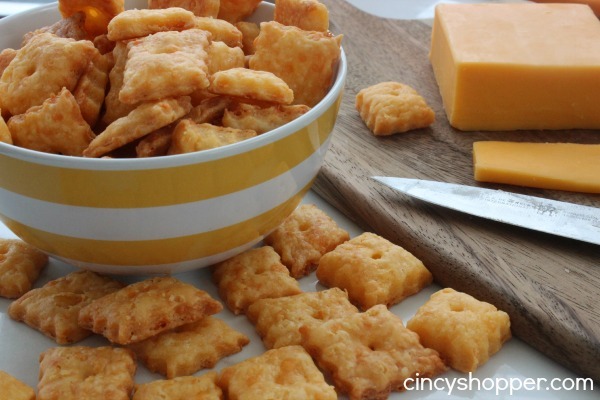 There is just something about yummy baked cheese crackers. All of my kiddos have liked them when younger and now as teens they do too. The hubby can do some damage on a fresh box of Cheez-It Crackers too! I could not believe how simple these Cheez-Its Crackers were to make. The main tip I would give is to make sure you roll the dough almost paper thin. The thinner they are the better they taste. I always have blocks of cheese in the fridge. We are a cheese eating family. Every time I catch a great sale, I load up what we call the cheese drawer around here (know to others as the deli drawer, ha ha). 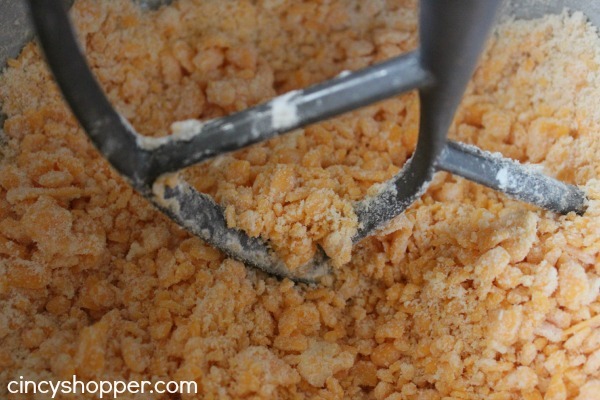 Blend the cheese, butter, shortening and salt together on medium low speed in a stand mixer or with a hand mixer. Add the flour and mix on low to incorporate (the dough will be dry). Slowly add the water just until the dough comes together in a lump. Form into a ball and wrap in plastic wrap and refrigerate for an hour. 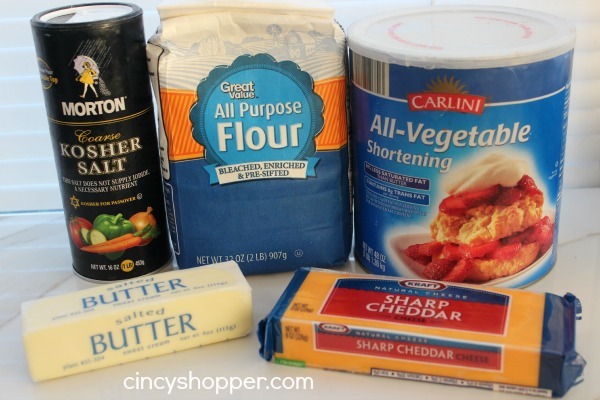 Flour your work area and roll out the dough very thin (less than 1/8″). 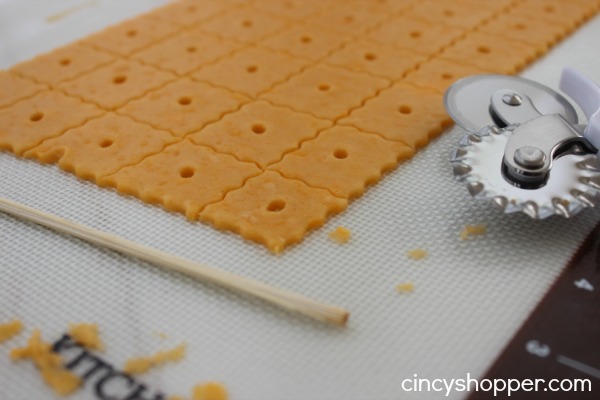 Use a pastry cutter to cut into 1″ squares and use a skewer or toothpick to put a hole in the center of each. Transfer to prepared baking sheet. Bake for 12-15 minutes or until light brown at the edges. Transfer to a cooling rack and allow to cool. My little guy really liked these homemade Cheez-Its. I am not sure I could keep up with his consumption though ha ha! I really liked that I made them fresh. I am going to make up a fresh batch for him again this weekend. Flour your work area and roll out the dough very thin (less than 1/8"). Use a pastry cutter to cut into 1" squares and use a skewer or toothpick to put a hole in the center of each. These looked so good I pinned them! 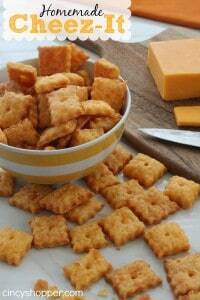 Another great recipe for homemade Cheez-Its. Thanks for sharing and linking up with us at the #WWDParty – Happy Valentine’s Day. These are too dang cute and the recipe looks so simple. My kids would love this one! Thank you so much for sharing this awesome recipe with Full Plate Thursday. Hope you are having a great weekend and come back soon! These look fantastic! Thanks for linking up to the Weekend Wind Down Party last week! Hope to see you there tomorrow night! I found this recipe on Pinterest and had to try them. Just made a batch and love them. They are so easy to make. I think I like these better than the store bought ones. Thank you for the recipe! Made these for my family and they were a hit. I sub the shortening for coconut oil. Toddler and Husband approved!